Preheat oven to 190°C/375°F. Separate eggs. Beat egg yolks in a small bowl with a fork. Place egg whites into the bowl of a stand mixer or a large mixing bowl and beat together with salt until stiff peaks form. Slowly add part of sugar and whisk for approx. 1 – 2 more min. Carefully fold egg yolks into egg whites using a whisk. Mix flour and starch together and sieve over egg mixture in 3 – 4 batches. Carefully fold into egg mixture. Transfer batter to a parchment-lined baking pan and bake at 190°C/375°F for approx. 11 – 13 min., or until golden brown. Spread a clean kitchen towel over work surface and sprinkle evenly with sugar. Remove sponge cake from baking pan, turn out onto kitchen towel and peel off parchment paper. Set aside to cool completely. Soak gelatin for approx. 5 – 8 min. in cold water. Heat up some of the cream in a small saucepan over medium-high heat. Add gelatin and let fully dissolve. Remove from heat and set aside. Add cream cheese, part of the sugar, and vanilla extract to a large bowl and whisk together. Add heavy cream to a grease-free bowl and whisk together with cream of tartar and some of the sugar until cream stiffens. Add a few spoonfuls of cream cheese mixture into gelatin mixture to adjust temperature. Add gelatin mixture to bowl of cream cheese and beat together until smooth. Gently add whipped cream a little bit at a time, to keep as much volume as possible. Place sponge cake in baking frame, if using. Add cream cheese mixture and smooth evenly. Place in the fridge to set for at least 6 hrs. or overnight. 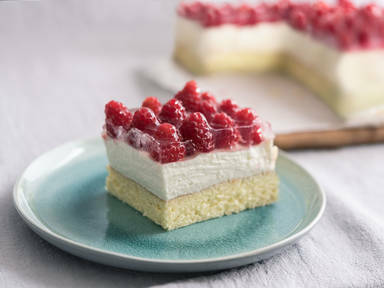 Place raspberries on cake. To prepare jelly, heat up remaining water with sugar and clear jelly powder in a small saucepan. Bring to a boil and simmer for approx. 3 – 4 min., or until it thickens. Then, carefully spoon over the raspberries on top of the cake. Let set for approx. 10 min. For a final touch, gently toast the almonds in a pan over medium heat for approx. 4 min., or until fragrant. Let cool completely. Before serving, remove cake from baking frame and decorate sides with almonds. Enjoy!